Anti-Aging Serum Complex 50 ml / 1.7 fl. oz. smoother and visible imperfections greatly reduced. results that are not possible from other products. This skin care cream, a true concentrate of brilliance for the skin, is enriched with an exclusive Hydralift complex, composed of Edelweiss, of Ginseng, algae extracts and papaya which bathe the skin with energy and hydration necessary for it to defend itself against harmful environmental agents. - effective soft focus micro particles that refocus the effect of light on the skin, reducing the visibility of wrinkles and erasing imperfections. - spheres of collagene that penetrate the heart of the wrinkle infusing it with water to eventually push it outwards. 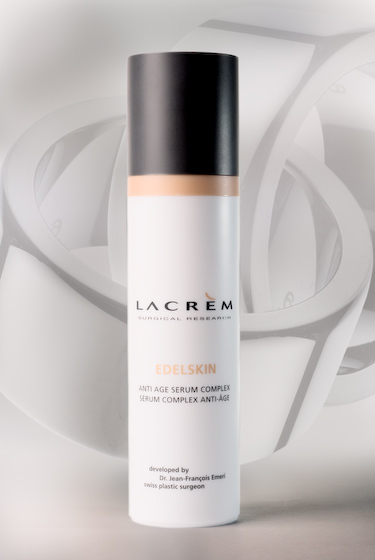 Lacrèm’s scientists developed this serum to have a lasting effect. This is why the formulation has been coupled with a revolutionary peptide called long term action anti-wrinkles that inhibits wrinkle forming muscle activity. Apply in the morning on a perfectly washed and toned skin in combination with the anti-age Edelskin cream or the Luxury morphing face cream. In the evening, for an intense surge of luminosity, apply the product twice under your make-up. This will replace your usual skin care product and will give your skin an incomparable brilliance.